Bacon makes everything better, right? 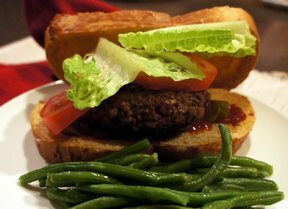 And these burgers are no exception! 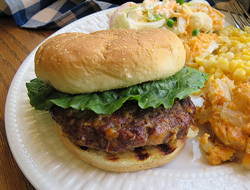 The bacon keeps the burger moist and adds great flavor. In a large bowl, combine the cheeses, onion, egg, ketchup, Worcestershire sauce, salt and pepper. Crumble in the ground beef and add the bacon. Mix together by hand just until combined. 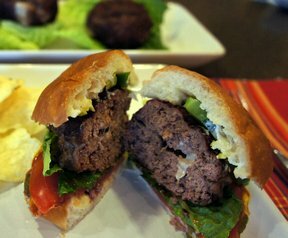 Don't over mix or your burgers will get tough. Form into 4 patties. Place patties on the grill, and cook for 5 minutes per side, or until done. Place buns on the grill to toast cut-side, watching closely. Serve on toasted buns with any toppings you prefer. 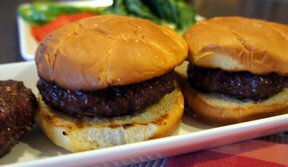 "I wanted to try to beef up the flavor of some hamburgers for a cookout I was having and found this recipe. It had cheese and bacon in it so I thought that sounded interesting. They turned out great. All my buddies loved them."